When it was first announced, the Notion Ink Adam tablet looked awfully like vapourware: a tablet that cost less than an iPad, delivered more horsepower than the average Android device and included an LCD screen that did a great impression of E-Ink sounded too good to be true. Apparently not: pre-orders are shipping, and we're mere days away from discovering whether the Notion Ink Adam is the gadget of the decade so far or 2011's Palm Foleo. So what's all the fuss about? Here's what we know. The planned November release date came and went, but it's shipping now - sort of. 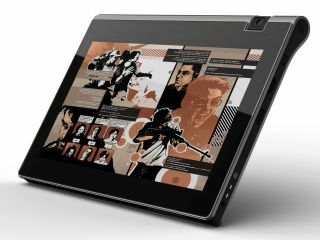 The tablet hasn't passed EU approvals yet, but Notion Ink reckons that a UK release date is imminent. The Adam specifications revolve around a dual core Tegra 250 processor, which is based on ARM's Cortex A9 and tuned for 1080p high definition video. There's a gigabyte of RAM, 8GB of flash storage (which can be supplemented via the Adam's microSD slot) and a 10.1", 1024x600 display. The usual Wi-Fi, Bluetooth and 3G are present and correct along with a 3.2MP swivelling camera, compass and GPS, but the Adam has another trick up it sleeve: an optional Pixel Qi display that can turn off its backlight to deliver an E-Ink-style reading experience. The Adam will ship with Android 2.3, aka Gingerbread, but Notion Ink promises that the Adam will be fully compatible with - and updated to - Android 3.0 Honeycomb when Google finally finishes it. There's a bit of a kerfuffle over the Adam's screen: the blurb promises "pure matte glass", but customers are finding that it's a glossy screen with a matte screen protector instead. In an email to Slashgear, CEO Rohan Shavan clarifies things somewhat: the panels themselves are matte, but there's low gloss glass on top of them. The short-lived ordering page on the Notion Ink website - all orders have been sold out - listed four versions of the Adam, all priced in US dollars. The backlit LCD with Wi-Fi was $375.33 and Wi-Fi plus 3G was $425.33; the Pixel Qi LCD was $499.45 for the Wi-Fi-only model and $549.99 if you wanted 3G too. At current exchange rates and taking VAT into account, that means the Notion Ink Adam UK price would range from £282 to £414. Cheap, isn't it? You can't fault Notion Ink's enthusiasm: where most tech firms wait for their customers to fill the internet with unboxing photos, Rohan Shravan has decided to post his own on the Notion Ink blog.